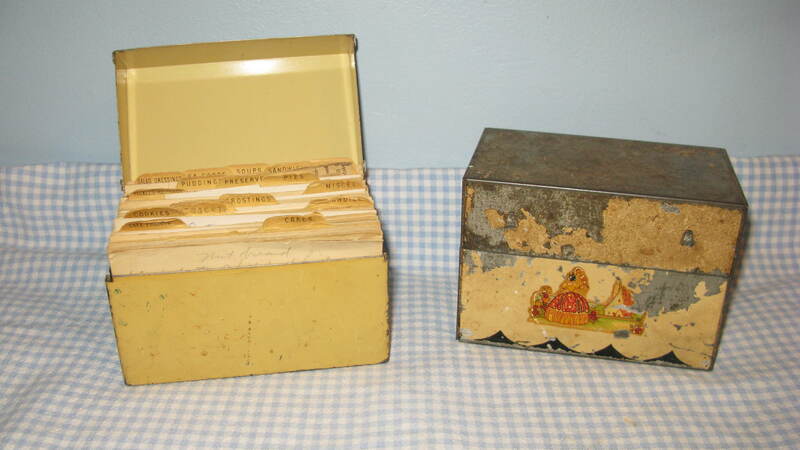 In a drawer in my bedroom I have kept two old recipe boxes for several years. They belonged to my Grandma Dora. On occasion I think about how I want to get them out and start cooking and baking from those recipes – experiencing the tastes and flavors of days gone by. I’ve finally decided that I am going to go ahead and dig into those boxes and see if there are any “gems” of recipes hidden inside. My grandmother died when I was 3, so I didn’t get a chance to experience much of her cooking. But, I have heard my dad talk often about things such as date filled cookies and steam pudding. My sister, Wendy, is going to join me on this journey through the recipe box. So, together, we’ll take you along to see what we find. As I looked through the recipe boxes to select my first recipe to try, I saw that there were a lot of desserts, breads and side dishes and not as many main dishes. I suppose many main dishes were made without a recipe to follow. A lot of the desserts contain fruit, nuts and spices rather than the chocolate and peanut butter that we use so much. I saw a recipe for Date and Nut Cake and decided to try that first. 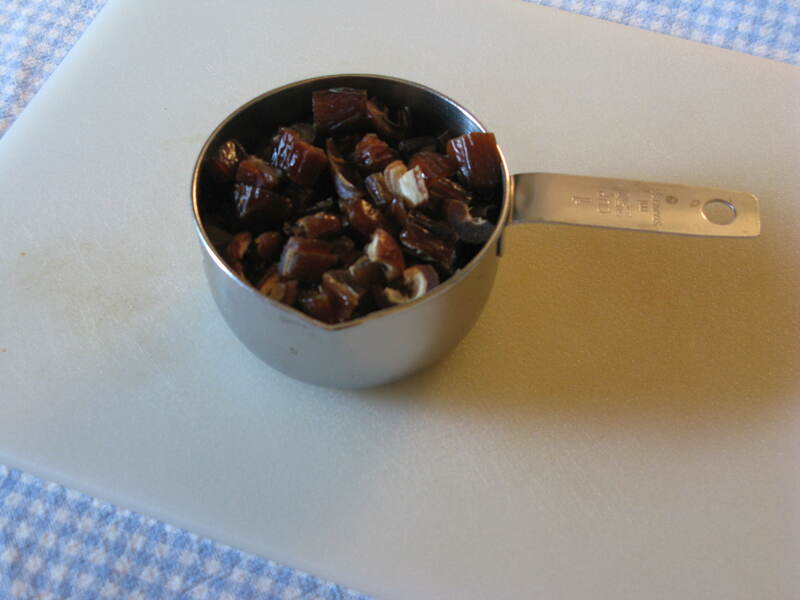 Mix in dates and 1/2 cup of chopped nuts. Bake in slow oven. The recipe doesn’t have all of the details I am used to, but I suppose good cooks back then knew without writing it all down. I didn’t know how much a package of dates was so, I found another recipe for Date Oatmeal Cake in the box that was cut out of a newspaper. It called for 1 1/2 cups dates, cut in pieces. It looked like a larger recipe than the one I was making, so I decided 1 cup of dates would work. I decided to chop them into pieces since that is what the other recipe said to do. The recipe just said vanilla, so I decided to go with 1 teaspoon as that seems pretty standard. It also said, 1/2 cup chopped nuts. I thought walnuts would go nicely, so I used 1/2 cup of those. (I like to chop nuts like walnuts, almonds and pecans in large quantities and freeze them, so I can just pull them out when a recipe calls for chopped nuts. It saves time.) The recipe says bake in slow oven. I looked at the other recipe. It said to bake the cake at 350 degrees for 45 to 50 minutes. I decided that sounded good. It took about 45 minutes for a toothpick inserted to come out clean. So, the new recipe, for ease of use, is below. Preheat oven to 350 degrees. Pour cup of boiling water over chopped dates. Add soda and let stand until cool. Cream together sugar or Karo syrup and oleo or crisco. Add flour, egg and vanilla. Mix in dates and 1/2 cup of chopped nuts. Bake 40-45 minutes or until toothpick inserted comes out clean. The cake looked very pretty on a plate, but I wondered how it would taste. My family all tried it with varying opinions. I was pleasantly surprised to discover that it tasted delicious. It is a different taste than we are used to. It reminded me of something you might serve at a tea party. I can imagine it being served with a dollop of whipped cream. 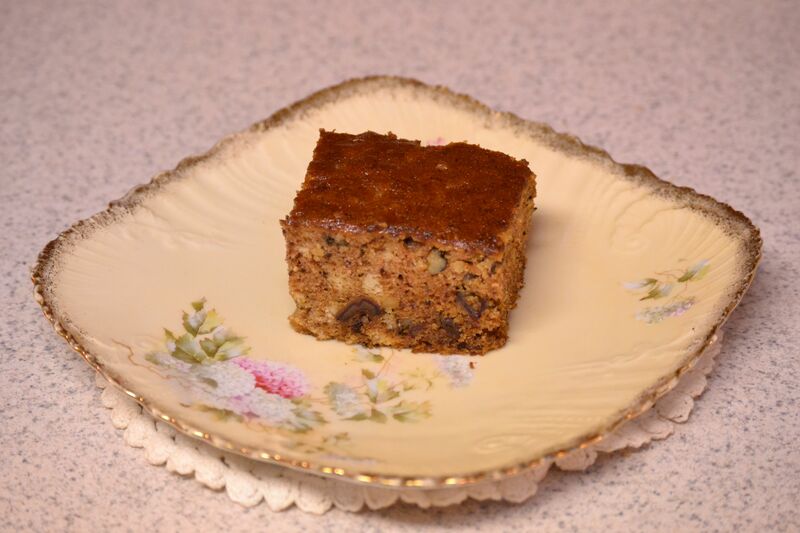 Date and Nut Cake served on Grandma Dora’s plate. My first recipe was fun to try. I look forward to sharing another with you soon. If you try it, please let me know what you think! 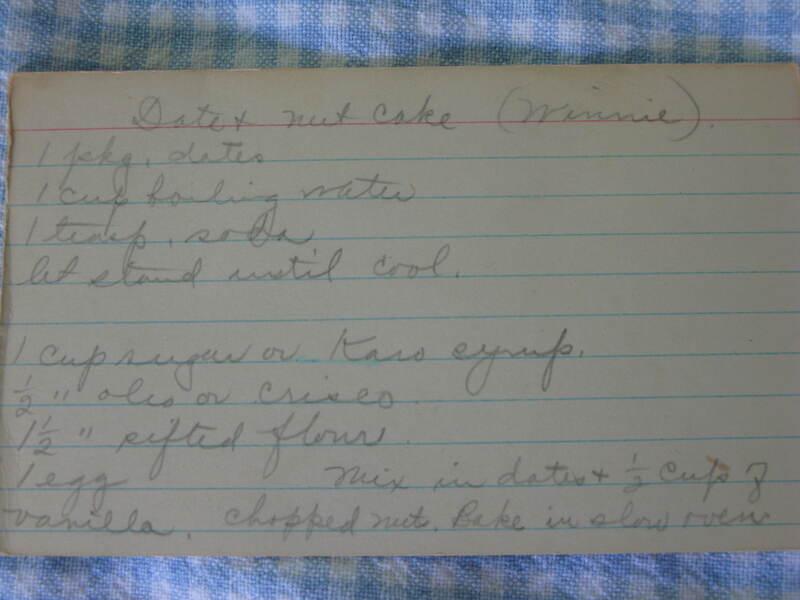 This entry was posted in Cake and tagged baking, cake, dates, farm cooking, grandma's cooking, homemade, scratch cooking, walnuts by GrandmothersRecipeBox. Bookmark the permalink. Thanks! We hope to have some more up soon!